Horses Dreams Creative Studio. If you love horses, you can spend hours coloring the various templates. In addition to coloring can add the stickers that you like included in the notebook. Colouring book collection Dreams of Horses Topmodel. 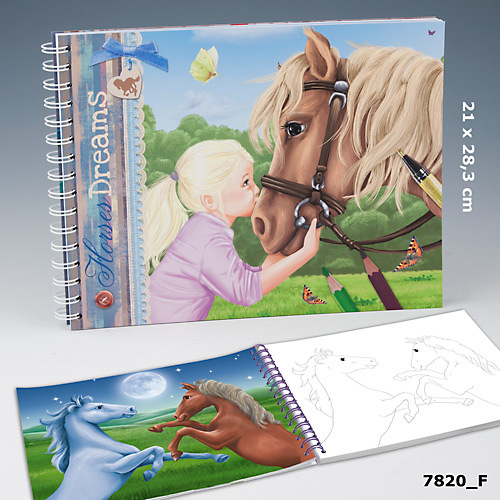 Inside the booklet you will find different templates for coloring the horses. Encontras horses in the countryside, horses with their Amazons, several images that you can color. Once you finish coloring the design you can add some stickers which also includes the notebook, to give that final touch you. Horses Dreams colouring book measures: 11.5 x 14.5 x 1.5 cm.